In my setting, the planet is grossly overpopulated. Vehicles are required to carry large loads of people from place to place. Bi-articulated buses are a necessity and have replaced regular buses as a whole. However, I want to use double-decker tri-articulated buses rather than bi-articulated ones. Would such a vehicle realistically work? My setting has little difference from our modern day society in terms of the structure of roads and the like. On a side note, how many passengers could it realistically hold? The closest real-life counterpart would be the Neoplan Jumbocruiser, a double-decker bi-articulated bus that could hold 170 passengers. As far as road trains go, your tri-articulated bus is a bit tame. There's no real reason you could not have such a bus, though it can be difficult for them to go around sharp corners. Its hard to make a road train have varying angles between the segments. Physics likes to make them all have the same angle. This issue could be resolved by putting a driver on the tail segment to drive the back wheels. This is also a common approach for long vehicles such as NYFD's Ladder 34. Your real limit is convenience. At some point, it becomes more convenient to simply have two busses. That quickly leads to it becoming the most efficient solution as well. If you have long hauls, like the Australian rigs do, you get really nice drafting bonuses to your efficiency. If you're Ladder 34, you can have a bigger ladder than anyone else. But if you're just ferrying people, there's limits to the advantages of road trains. When you get right down to it from an energy perspective, trains are always always more efficient than buses when you know where your population needs to be. If your society has any comparison to modern societies, your cities are going to be segregated into 3 main areas; residential, commercial, and industrial. These distinctions are already fully understood and the need for transportation of people between these districts is also already fully understood. In any economic model, industry is what allows a society to grow and function. Commerce is merely a method of churn within a society that is capable of generating its own industry. What this means in practice is Ring Roads. If you have people living all around the outer edges of your commercial centre, you also have industries relatively evenly distributed around that centre. Commerce, by definition, needs to be in the centre of a given industrial society so as to allow the even distribution, export and import of good across that society. Industry on the other hand is better placed in close proximity to the source of raw materials and labour for that industry. As a result, ring roads allow for the populace to reach the primary sources of employment around the centre of the society defined by the city in question. What all this means in practice is that if you know where your people live AND where your people work, then putting in tracks and train infrastructure is far more cheaper than building roads AND ever increasing sizes of buses and other capital transport investments to get people from home to work and back. Ultimately, most cities are reasonably predictable. That means that you know how many people are travelling between point A and B at any given time, which in turn means that you can plan for rail options to move those people and have a far more energy and financially efficient model of transport for goods and workers. Buses (God bless their cotton socks) are really about filling gaps in change between distribution conduits. If you have an established transit route, trains will always be more efficient than 'road train' bus and cargo models. That said, in a society where (geographically) there is constant changes in residential and industrial sectors, buses are the way to go because they require less up front capital expenditure. Most large cities however do not follow that model, and if you want an example of how a large organised society can fail to implement efficient public transportation via rail, one need look no further than Los Angeles. In my home town of Canberra, Australia, this debate is currently an active part of local politics. The anti-light rail lobby always point to cost, and yet the local government is already restricting parking spaces in the central regions to the point that parking is becoming a blood sport. They say that it's in order to promote choice, without really giving an alternative. This is despite Canberra's bus company (ACTION) heavily investing in articulated buses. Bottom line is that as any city becomes more heavily congested, the answer is always more efficient alternatives to road congestion. Larger and larger buses are not the answer in such cases; what is needed is a transport conduit that bypasses roads completely and which our DNA is somehow programmed to give way to, regardless of how congested the roads may be. The answer to that is trains. @Niobium_Sage - Do you really mean tri-articulated? Most articulated buses have a single articulation. Bi-articulated vehicles are shown below. 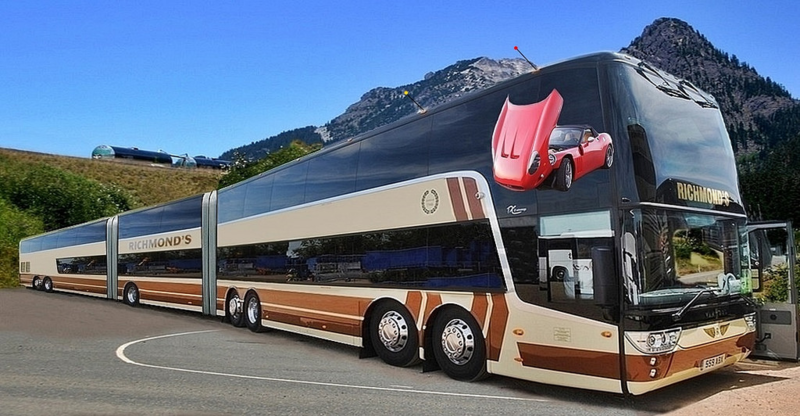 Double Decker Huracan / Bi-Articulated Buses. Would it work effectively, you ask. I think what I read here is YES, but it wouldn't be a top choice logically. But for world building, who needs all that logic? Maybe you're scheming an off-grid triple-segment articulated bus chase and can't tell us without spoiling a plan. With that said, I agree with an above comment that a driver in the back would be MORE effective but not required. Think of luggage carriers that chase planes around the airport. They have all manner of extra cars segmented or articulated or not and off tracks. The biggest danger comes when the back tracks a different radii than the front; when a 90-degree turn deteriorates to a wider, 70-degree turn. In chasing the most effective operation for your lesser logical vehicle, you might enjoy pursuing the engineering that minimizes that danger. The real life physics might add more to your story that you still can't tell us! I think even articulated busses need wide turns but something about those luggage carriers keeps their back tires in good line with the path the front tires took and there's no second driver. You might find 15-segment articulated carriers that hold eight or ten passengers a piece provide more juice for your efforts AND fit the bill for solving engineering problems. One of the problems encountered with the introduction of articulated busses in London was that the roads and streets are just too narrow. London has less of a public transport crisis that other Cities however, in part because of it's extensive underground railway network. Several Cities in the UK are reopening their tramway systems as a solution to the problems with busses. Sheffield has linked it's tramway system to the main railway network allowing trams to stop at local railway stations and small trains to pick up passengers around town. Why a bus when you can use a train? If overcrowding is an issue, then buses are not the best solution. The solution used in the most crowded places on this Earth are trains + walking. Subway trains can easily get anyone in a very dense city to within 1 km of their destination. Their feet can take them the rest of the way. Trains are more space and speed efficient that road vehicles. 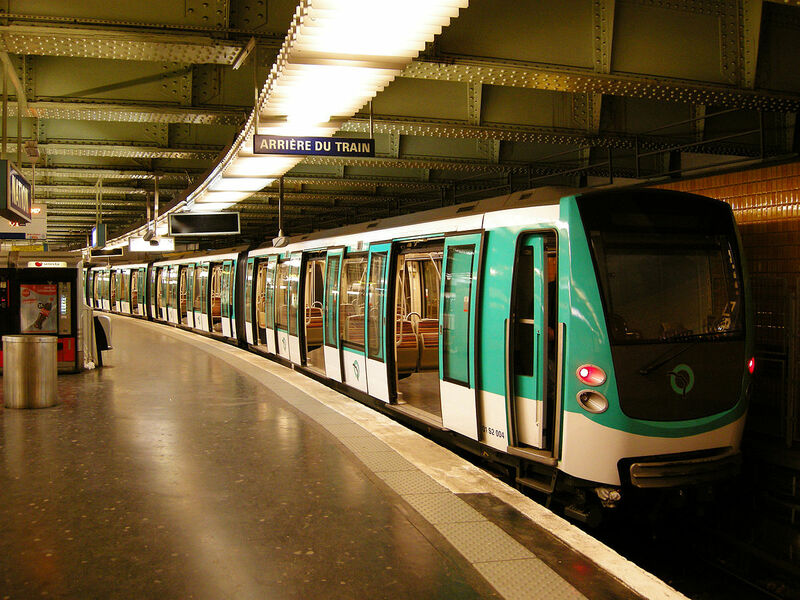 Because they are better connected to the tracks than a bus is to the road via tires, a train will start faster, stop faster and are able to move faster on curves; and trains, as pictured below on the Paris Metro, are easily able to accommodate 8 cars in urban environments. Further, the performance of trains on dedicated tracks will be less affected by buses interacting with pedestrian or commercial traffic. Furthermore, there is a significant body of research that shows that 'at-grade' boarding is more efficient. 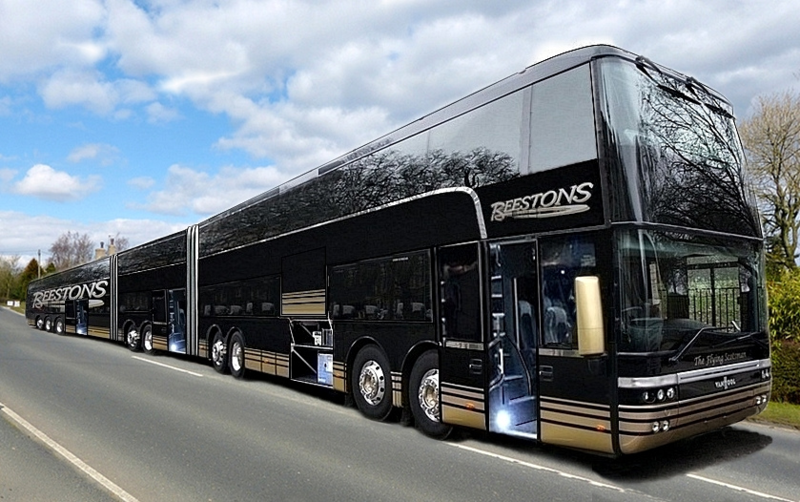 The per-coach passenger gain from putting a second deck onto a bus will actually slow down the transport of passengers if there are frequent stops. The time taken for people to load and unload from the upper level will cause the trains run-time to slow down so that the total number of people transported will drop compared to a single-decker train. Of course, you just build train stations with two levels so people can on- or off-load 'at-grade' either way. Rather than favouring trains or buses, I would point-out the technical issues with those buses. Have you ever ridden an articulated bus, with one trailer? There is a round platform at the connection of the bus to the trailer. This platform is not one solid disk, but two halves hinged together. The bus does not just turn corners: the road may slope up and down. This creates an extra articulation: the joint can bend left and right as well as up and down. Without that disk, the bus floor would be open and people may fall-off under the bus! Double-deckers should have two articulation joints. That is one for each deck. However, if the bus has two articulating joints, one atop the other, how would the articulation swing up and down? I can see that the work around that problem is a complex feat of engineering. The top joint must deal with stretch-and-press in addition to the other movements. I wonder how the passengers at the upper deck would walk above such a joint. Another problem that no one has mentioned yet... backing up with more than one towed 'trailers' would be very difficult. Multiple vehicles provide a better and more flexible solution (if you'll forgive the pun). Other answers give good reasons why. Not the answer you're looking for? Browse other questions tagged near-future transportation vehicles or ask your own question. How would an interstellar spaceship's speedometer work if everything else is moving? How would society be affected by ultra-highspeed travel? In the future, how would a cybernetic implant work? How would technology adoption of Lithium Air battery work? Would trams be workable on a low-gravity world?